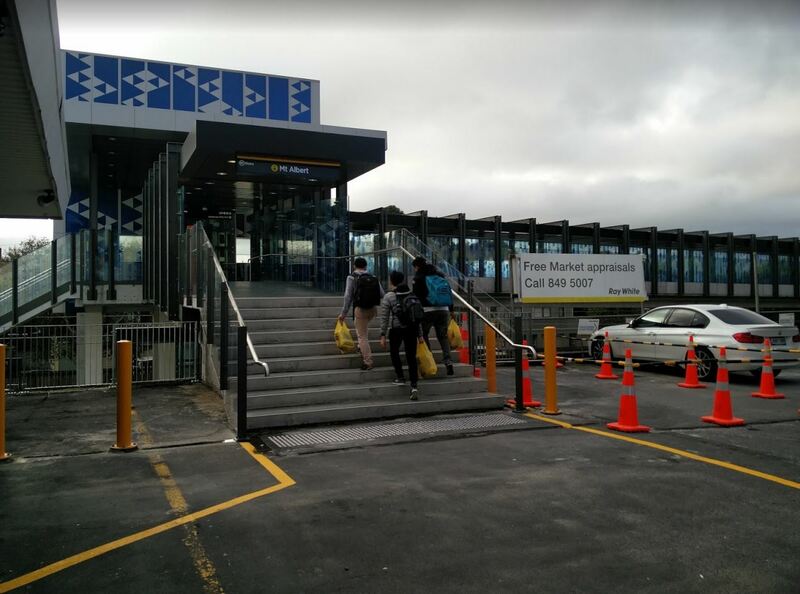 On Saturday a short but important and long awaited new connection was officially opened to the Mt Albert Train Station. 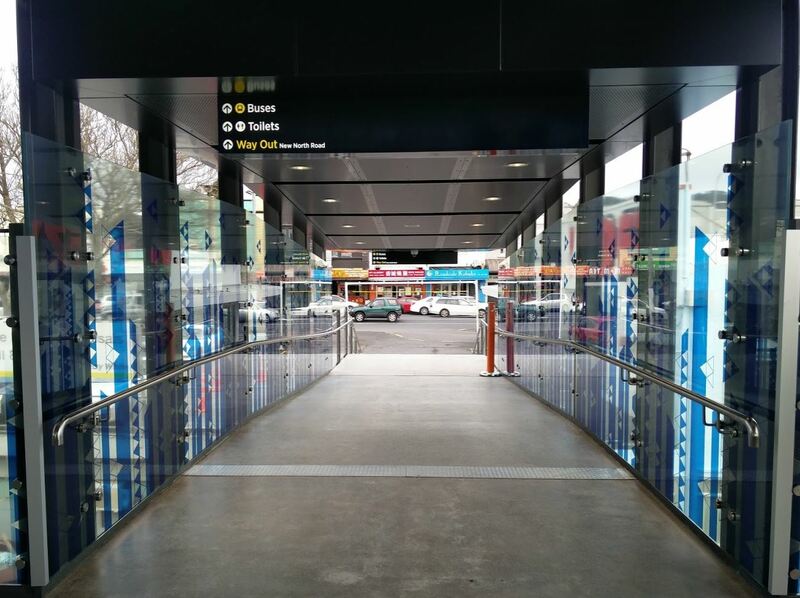 A new bridge crosses the tracks and directly connects the concourse added when the station was upgraded in 2013 upgraded with the town centre, saving a detour out to Carrington Rd and back. The connection was planned for when the station was first upgraded so s you’d expect the new bridge matches the design of the connection out to Carrington Rd, including the smart and distinctive pattern on the windows. At this stage the new connection is only for able bodied people though as it ends in stairs. Those, such as wheelchair users still need to use the Carrington Rd exit. The exit also puts users out into the carpark that still exists and which I believe is subject to a long term lease, how long till we see someone ignoring the paint and parking over it. Upgrading the carpark to a plaza for people is being considered as a future option though and it’s at that time it appears ramps may be provided for this exit. Mt Albert is in a prime spot, served by both the train station and multiple bus routes as part of the new bus network coming next year. This will be further cemented after the CRL is completed which will have the effect of shifting the town centre much closer to town. Given this and its current urban form, it is more ripe than most for some serious urban regeneration – the row of buildings that back on to the station are looking particularly sad. This bridge is one small step in enabling that to happen. Following it’s 2013 upgrade I’d say the station is arguably now one of the best stations in the city, a far cry from it looked like just over three years ago. Thanks for this! It would so great if you could look at the town centre upgrade plans and the case for why the right hand turn from New North into Mt Albert Road is being removed – it’s for the continuous cycle way I presume, but I would love some expert comment as to why this is so important… People (drivers and business owners) are going off about it on the Mt Albert Community Facebook page – one has even started a petition. A few of us have been commenting but there hasn’t been much on it to point to (I think it was decided at a closed part of a local board meeting). Thanks! From the report on the local board page, it seems like AT decided there wasn’t the width there for cycle lanes and a dedicated right-turn lane – to retain the five traffic lanes there, they’d have to make the footpath a shared path, and the footpath isn’t wide enough to make that work, especially with the numbers of pedestrians in the centre. Further south they seem to be taking out the median to make room for bike lanes (they mention ‘Copenhagen-style lanes’, which is exciting), but the median disappears at the intersection so there’s not as much width to play with. They also say that the light phasing hasn’t been determined and there may be a right-turn phase from the centre lane, depending on what the all-knowing traffic modelling says. I don’t know if anything further has been decided since February on that front, though. Well-deserved plaudits. A distinct improvement and the Albert Eden Local Board should be credited for stepping in with the finance for the new over bridge after Auckland Transport pulled its funding. It’s one of those still all too rare small but significant changes that integrate more closely the rail network into the built fabric of the community. 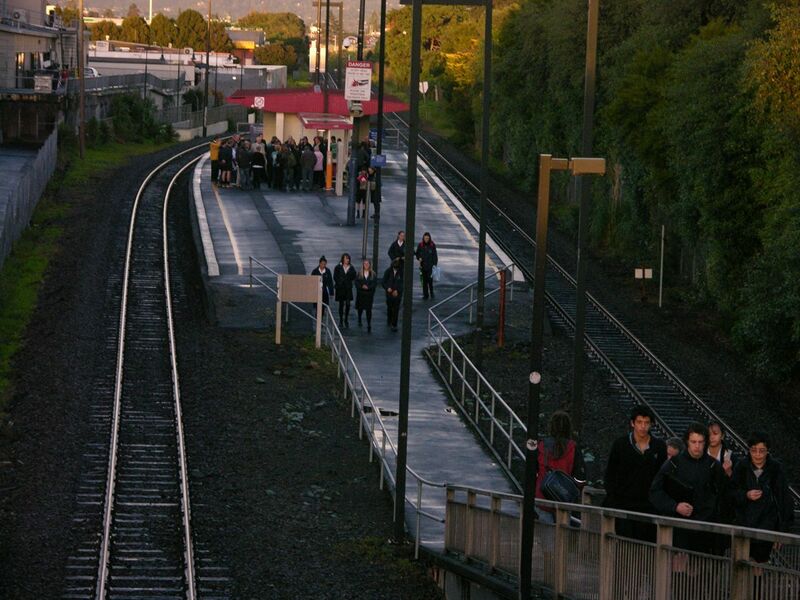 Unfortunately Auckland Transport’s have failed when it comes to integrating bus and rail modes of travel at Mt Albert and will continue to do so as long as they prioritise motor vehicle flow and storage over active/PT connectivity. Painting large cross hatched yellow lines over the pathway should prevent people parking there ‘by mistake’. It won’t stop people parking there (“I’ll only be a minute!”) but it will deny them the opportunity of saying “I didn’t know”. Or some of that green bus lane paint maybe? That picture, wow. I’d forgotten what the station used to look like. What an improvement! I’m pleased this missing link has been filled in, and it looks like it will be great for both (able-bodied) travellers and the centre, but it’s disappointing that wheelchair users have been left out. It’s a long way around to Carrington Rd and the footpath is not great, so that may be prohibitively difficult for some people. A ramp shouldn’t be an optional extra and we shouldn’t be designing inconvenience for wheelchair users (and parents with pushchairs and elderly people with wheely bags). Have they said why they couldn’t build the ramp in the first stage? Does it depend on getting access to the carpark land? I would have thought they could negotiate the use of enough space for a ramp. I agree. Its a real shame that access for the disabled has not been provided in this stage. Too often ease of access is over looked. But its not just about wheel chairs, those with pushchairs or have difficulty with stairs also need a ramps for easy access. Or a small lift – these don’t take much room at all. I understand they can’t put the ramp in until later as they don’t own the carpark where the ramp would go. They already had to come to an agreement with the sublease holder and landowner to take over the area where the steps land, so I’m wondering why they couldn’t negotiate for the ramp bit as well. It’s a little hard to critique the merits of this project when (yet again) no cost has been provided. What was the cost of this project? Go on then: now you can “critique” it; we await with bated breath. As someone who has just started using the station – looking at that photo from only 3 years ago is amazing. I almost wish I had seen it then. The bridge connection is a great idea and I’m impressed if it was the local board that got this done. The only real shame is that a roof was not built from covering the stairs like what is at Ellerslie . A full cover would defiantly make this a stand out station. Yes that gap from the stairs to the covered shelters makes no sense – and covering the staircase would make it less slippery in the rain. 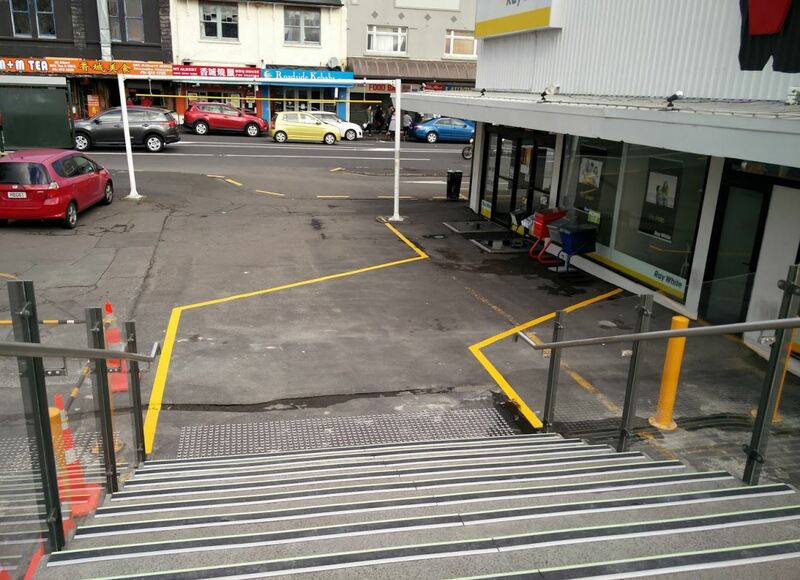 Seems to be an intentional design feature, the same gap is being built at Otahuhu. Looks great. A vast improvement. Mt Albert could soon be a real destination. Love the before and after photos. Examples like this just makes you wonder what the hell people are going on about when they talk about “Len Brown having wrecked Auckland”. What planet are they living on? If somebody has some good photos, a post of various parts of Auckland before and after the super city would be really interesting. I don’t bother listening to those people anymore. They’ll complain no matter who is elected mayor. Len Brown is great advocacy for Auckland public transport. Its such a shame many people will only remember him for his controversy. I can understand if people wanted him out for putting his willy where it shouldn’t have been, especially while at work, but that doesn’t seem to be what people are complaining about on local facebook groups etc. It is not even just about rates, they honestly seem to believe that Auckland is a much worse place now (and most of these people seem to be home owners, so aren’t caught by they biggest current issue of rocketing house prices locking out those who haven’t yet got on the ladder). Although I don’t agree with their logic, I can kind of understand people complaining about rates, but to say Auckland is a worse place, just doesn’t compute with me. What really gets their goat is immigration: not Brown’s rsponsibilty at all. But as it is Key’s, and he can do no wrong, they have to find someone else to attack. Some of these same people will probably find themselves relying on public transport in later years, which Len has advocated for, but they don’t have the ability to see beyond their current experience. Will be interesting to see how much and how soon urban regeneration will flow from this. How long is that lease on the carpark? That would be the obvious thing holding it back. Plaza plans look great. The sooner they are implemented, the sooner the place will flourish. I believe the lease is up in 2022 unfortunately. It was too expensive for the council to buy outright now. They were lucky to get this over the line now as it was. Oddly enough, I understand the site used to be owned by the Mt Albert Borough Council. I vaguely recall there was a community hall on the site until the late 1960s. Usual story: public assets flogged for private gain. 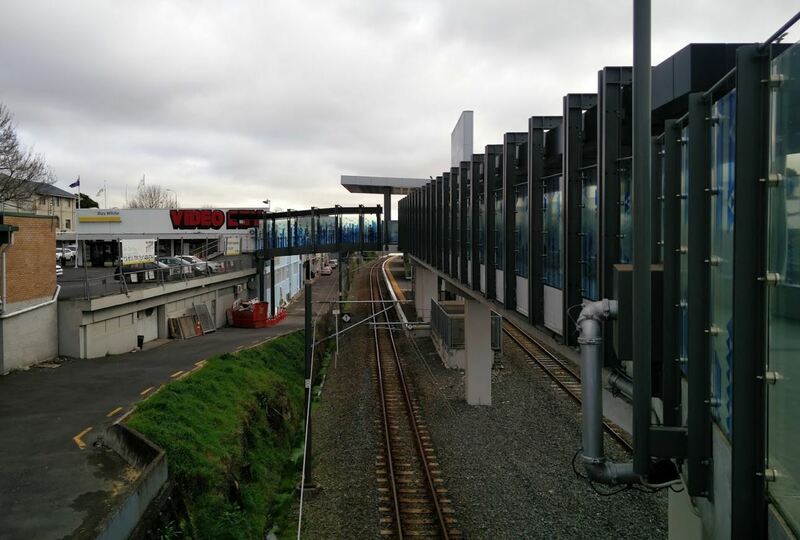 There’s a Mt Albert train station? The disabled access was not forgotten or ignored – a ramp was most definitely part of the plans. Unfortunately, some time after the Local Board acquired the long term lease on the car park where the new bridge access “lands” (at a cost of over a million dollars) we discovered that there was an existing sub-lease for the parking spaces which had some years to run. The Board is not legally able to buy or lease property directly so all negotiations have been indirect via the Council’s property CCO (now part of Panuku Developments) – we cannot be sure of all the exact details but for some reason it has taken many months to clarify the exact term of the lease, with the third party claiming dates as far out as 2032 but it now appears that the relevant term is 5 more years. We have been able to buy out a separate sub-lease for a kebab truck which gave us just enough space for the steps but not the ramp. So, unfortunately there is no disabled access for now except via the concourse and Carrington Road – at least this is no worse than the previous arrangements. The future ramp is not a merely possible option – it will definitely be part of the new town square in 5? years, maybe sooner. How come the stairs on this new connection bridge haven’t been covered Graeme? Also the main stairs from the concourse to the platform are uncovered correct? Rob there are far busier stations than that that also don’t have covered stairs, or covered concourses for that matter. Which stations are those Ted? Take your pick, there is only two on the whole southern line. That’s not really an answer, just saying it wasn’t done elsewhere. So i’m confused, who owns this bit of land with the steps and the car parking? Private landowner, council long-term lease, and shorter term private subleases? Thanks, Graeme, that explains some things I had been wondering about. It’s great to hear that the ramp is definitely in the cards for the future, though it’s a pity it wasn’t possible right away. The carpark situation sounds complicated to say the least. I’ve been following the LB project updates and I very much appreciate the work you’ve put in to get the bridge built – looking forward to using it, and the future plans for the centre look excellent. I had a look at this yesterday afternoon. My first thought was that its not much for the money. And what a dingy little carpark to welcome visitors. No right turn from Mt Albert into New North Rd would solve the lane problem, traffic heading that way can either take the first right over the railway tracks, or turn right earlier at Alberton or Kitenui. So presumably the only way you can implement that plaza plan is taking over the lease when it expires and sign your own long-term one. And hoping Tramco consider a sale at some point in the future. Perhaps the planner should have got up from his or her desk and visited the site and did some simple investigation at the outset .That’s just common sense. Your right. I bet no one involved in this whole things has even been on a train let alone visited Mt Albert. Have you thought of running for mayor? A campaign based on narrow train station exits sounds like a real winner to me. Too bad nominations have closed. Maybe next time?